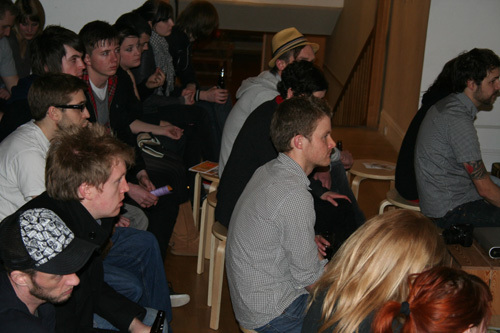 An evening with ABM 05 – PARTY TIME! 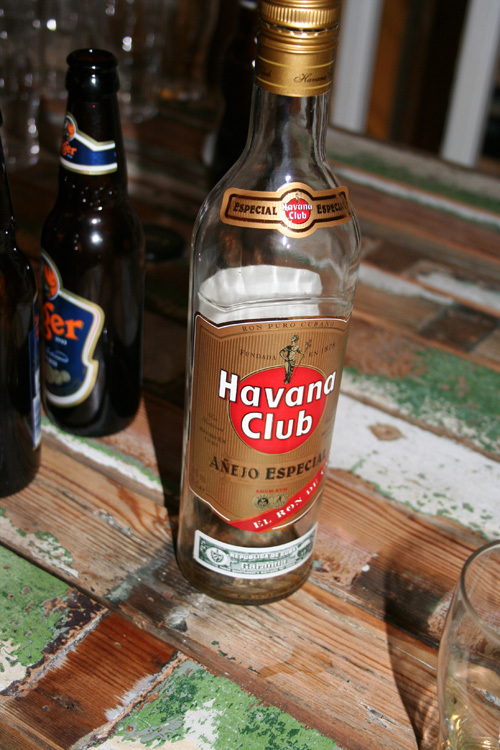 Sponsored by Bristol Beer Factory and Havana Rum – The night everyone has been waiting for. 5th in a series of 5. The closing night. Party time! The theme is epic rides and so apt for this event as a whole. Its been a roller coaster ladies and gentlemen with its incredible highs and interesting lows. On the whole I hope we all feel better for it. I certainly do. Its intention was to instigate discussion and I can safely say it has done that. Bristol, the UK’s first ‘Cycling City’, is now connected. Thank you to everyone who has taken part; the speakers for their time and inspiration and the public for turning up and being part of it. 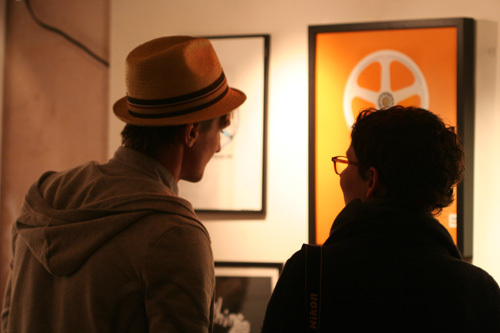 Thank you too to the artists who have contributed their wares for auction – the show looks fantastic! 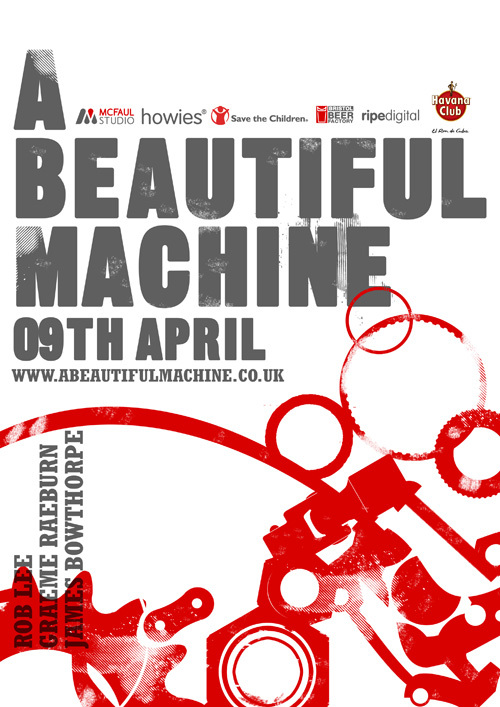 An Evening with A Beautiful Machine 05 is the end of my involvement but hopefully the beginnings of something bigger. Three incredible speakers. Lots of booze (obligatory). One very interesting DJ (he might not thank me for this) playing the tunes that kept him going around the globe! I hope the howies store is rammed! NOT TO BE MISSED! An evening with ABM 02 – TONIGHT! 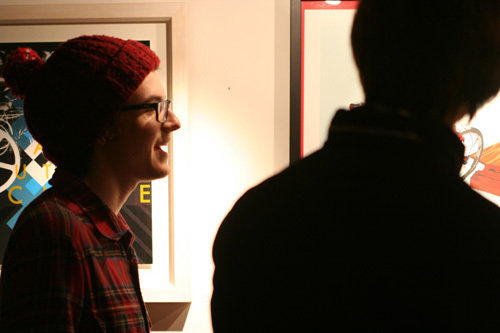 Laura Fletcher has been the head producer of the London Bicycle Film Festival for three years. 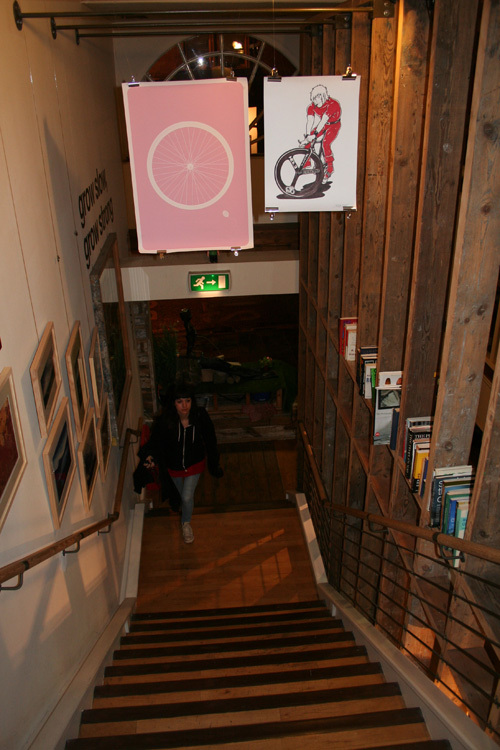 Residing in the UK since 2006, she has seen the rise of urban cycling over that time, and combines her knowledge of it with previously watching the re-emergence in New York. 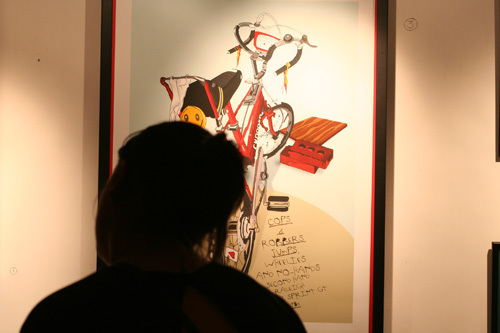 An avid cyclist herself, she has dedicated herself to promoting cycling through arts,music, fashion and film, allowing access for a greater audience. 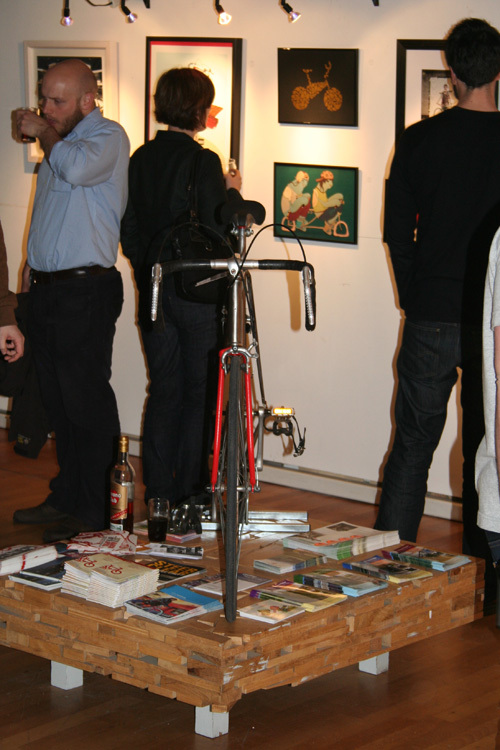 LONDON BICYCLE FILM FESTIVAL: OCTOBER 13-17, 2010. Dr Lowenna Smith is a rider and writer from Cycling Plus. In 2006, six months after Lowenna bought her first bike since childhood, she rode from John o’Groats to Lands End with her husband – and that’s when her obsession with road cycling really began. In 2008 she got into racing time trials through the support of her local club VC Walcot. That year she ‘just’ raced 10 miles, but in 2009 she rather upped the ante by completing two twelve hour road time trials. 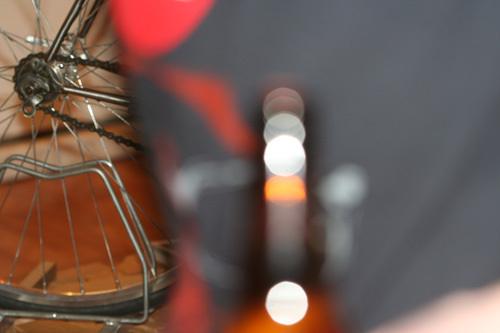 Training for these events remains a great excuse to ride her bike as much as possible. She’s on a bike six days a week and it’s a big part of her life. 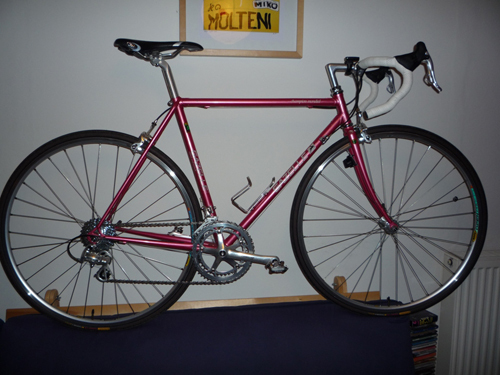 Currently Dr Smith combines teaching Physics at the University of Bath with product testing for Cycling Plus. Poppy Smith is fashion editor of Cooler magazine, an action sports magazine for women. After graduating from Central Saint Martins in 2005 she spent the winter snowboarding in Morzine, followed by a couple of years as a freelance writer and stylist based in Brighton before moving back to London to work full time on Cooler. Poppy currently has three bikes: a custom built fixed gear bike for commuting (which you’ll see at the talk), a road bike for cycling holidays and riding around the Cotswolds where she grew up, and a mountain bike for weekends in Epping Forest, or Wales if she’s lucky. 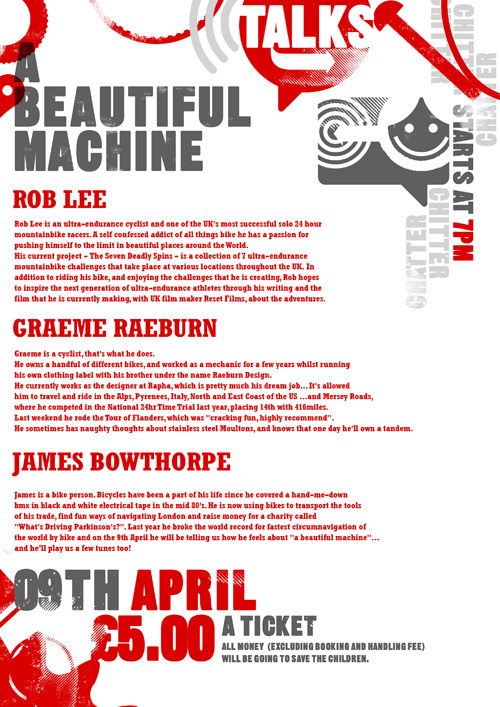 So – all you cycling ladies out there – come down tonight and listen to what these three luminaries have to say. Cycling isn’t, and shouldn’t ever be a male orientated sport. Just get out and ride! If all the tickets have gone just come down anyway – everyone is welcome! Just get there at 7pm latest. 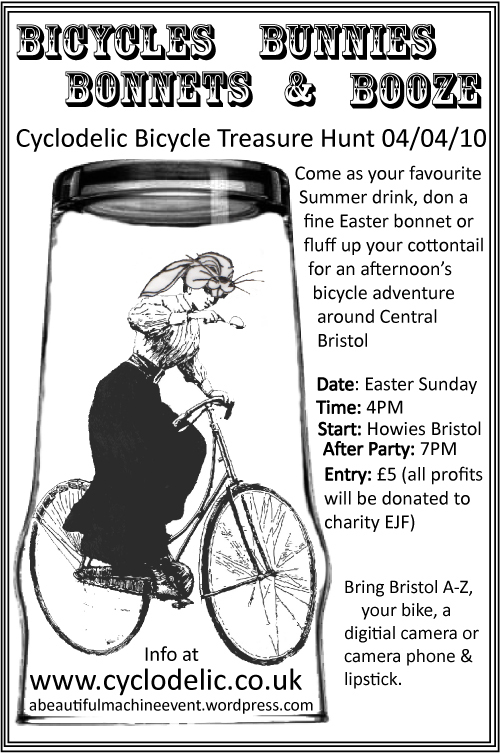 Come as your favourite Summer drink, don a fine Easter bonnet or fluff up your cottontail for an afternoon’s bicycle adventure around Central Bristol. 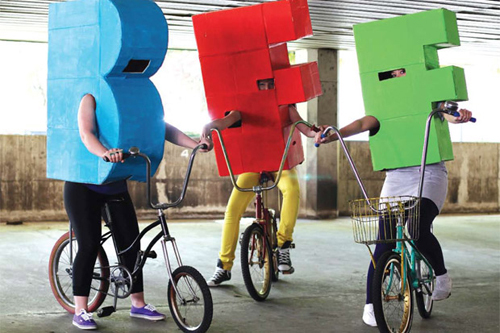 Cycle solo or in small teams to checkpoints around the city centre to collect Easter eggs & points & POINTS = PRIZES. In what order you collect them is up to you, some will be hidden & some will require tasks that can earn you points for style. Extra points will be given for best bunnies, top bonnets & booze inspired costumes (your Sunday best is allowed, as dapper & delightful will also earn you points). So…the launch…well, it launched! A petit and bijou affair I have to say but I think it struck the right chord and I hope we can gather momentum over the course of the next two weeks. It seems to be constantly work-in- progress and I like that. We’ve added more speakers to the roster and artwork continues to come in so it can’t be anything but. 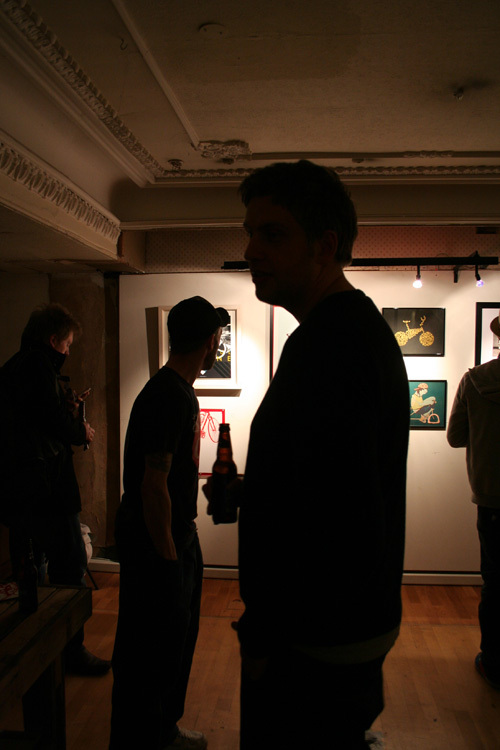 Friday then, was something of a soft launch and every talk night will be the same, I suppose, building to the climax on the 9th of April. Tim March came and delivered what can only be described as genius. His seated, no-visual monologue was the stuff of legend. Funny, real and passionate…whether he thinks so or not, he set the bar for everyone to come. Thanks mate. Amy and Xanthe from Cyclodelic were there adding a bit of glam to the proceedings delivering an inspirational talk on Cyclodelics beginnings and their take on what NOT to wear for the discerning female rider. So – it has started. From small things big things grow. The audience is as important as the speakers. There is a message to get across so be part of it. Tuesday evenings talks are an all-female affair with an amazing line-up. You cannot miss it. We obviously want as many ladies there as possible but I think it’ll be interesting for all. Cycling isn’t just for the boys! These girls will show you why!